2018 Toyota 4runner TRD OFF ROAD!! Lifted!! Brand new ICON Wheels!! Brand new NITTO Ridge Grappler 285/70r17!! 1 previous owner!! Clean carfax!! Super white exterior complimented with Black cloth interior!! Carbon fiber Trim!! Blacked out Emblems!! NAV!! 4x4!! Differential blocker!! Power mirror!! One key with spare and all books!! rear a/c vents!! Back Up camera!! USB Port!! Bluetooth audio player!! AUX port!! Cruise control!! Power seat!! WE FINANCE!!! CONTACT US 4693817040, We welcome third party inspections! We offer finance for any type of credit, First time buyers welcome. We take trade-ins, world-wide shipping, extended warranties available, installation of additional desired items, and MUCH MORE! Welcome to Extreme Sportcars INC, located in Carrollton, TX. We are a Retail Dealer specializing in offering the best customer service at a very competitive prices around the Metroplex. Here at Extreme Sportcars INC, we pride ourselves in getting the absolutely best and well maintained used vehicle inventory for our customers at the best price possible! We focus on having a pristine selection of pre-owned sport, suv and sedan cars domestic and imports. Our prices can't be beat! Every car is hand-picked with lovingly detail. Our passionate team focus on giving our clients the best experience through the sale. If you are looking for an easy way to shop with no hassle and stress-free shopping, stop by Extreme Sportcars or browse our online inventory. We Are Your DFW Premier Used & Preowned Dealer Near Dallas, Plano, Frisco, McKinney, Addison, Richardson, and other surrounding cities. 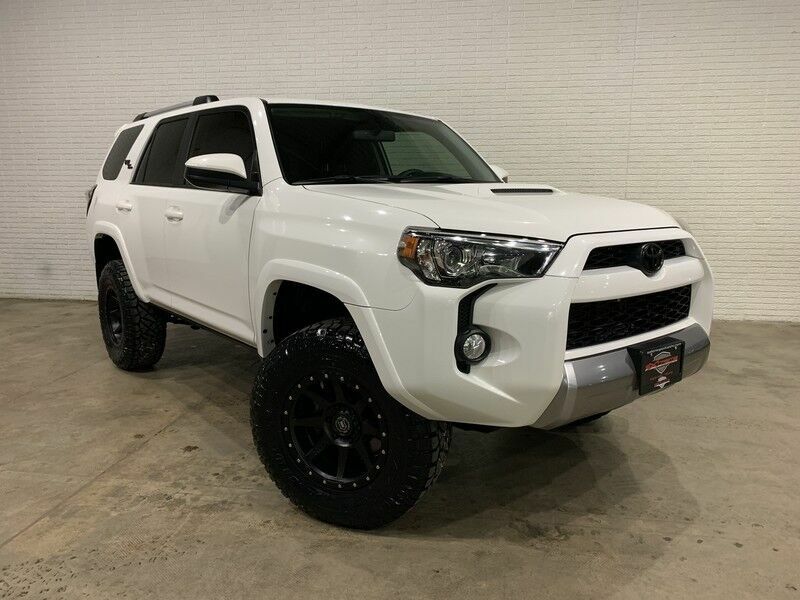 RARE FOUND 2019 Toyota 4runner TRD PRO with Upgrades allround!! Lifted with OLD MAN EMU BP51 front coilover with reservoir suspension!! Upgraded Icon Delta join Upper control arm!! AMP Power step! !HID 6k upgraded Headlights!! K02 bfgoodrich 285/70r17!! Steel Custom Series SR8 17" aftermarket wheels!! TRD PRO Center cap!! Upgraded TRD air intake filter!! Heavy Duty Upgraded EBC stage 3 Dimple and slotted Brake rotor with TRD Upgrade pads!! Bushwacker fender with match color!! Custom power coated roof rack!! Custom power coated TRD Skid plate!! Premium upgrade JL audio 3 pair of C3 speaker and 10" Subwoofer!! JL audio AMP for speaker!! all interior lighting Upgraded to LED!! Rear entertainment system 7" screen with inalambric headphone HDMI/USB/SCREEN MIRRORING Option!! NAV!! Back Up camera!! rear a/c vents!! Al three keys and all books!! USB Port!! Bluetooth audio player!! Automatic headlights!! WE FINANCE!!! CONTACT US 4693817040, We welcome third party inspections! We offer finance for any type of credit, First time buyers welcome. We take trade-ins, world-wide shipping, extended warranties available, installation of additional desired items, and MUCH MORE! Welcome to Extreme Sportcars INC, located in Carrollton, TX. We are a Retail Dealer specializing in offering the best customer service at a very competitive prices around the Metroplex. Here at Extreme Sportcars INC, we pride ourselves in getting the absolutely best and well maintained used vehicle inventory for our customers at the best price possible! We focus on having a pristine selection of pre-owned sport, suv and sedan cars domestic and imports. Our prices can't be beat! Every car is hand-picked with lovingly detail. Our passionate team focus on giving our clients the best experience through the sale. If you are looking for an easy way to shop with no hassle and stress-free shopping, stop by Extreme Sportcars or browse our online inventory. We Are Your DFW Premier Used & Preowned Dealer Near Dallas, Plano, Frisco, McKinney, Addison, Richardson, and other surrounding cities.